My entry for this week's Wednesday Vignette is a shot of a tattered seedpod from Lunaria annua (Honesty). 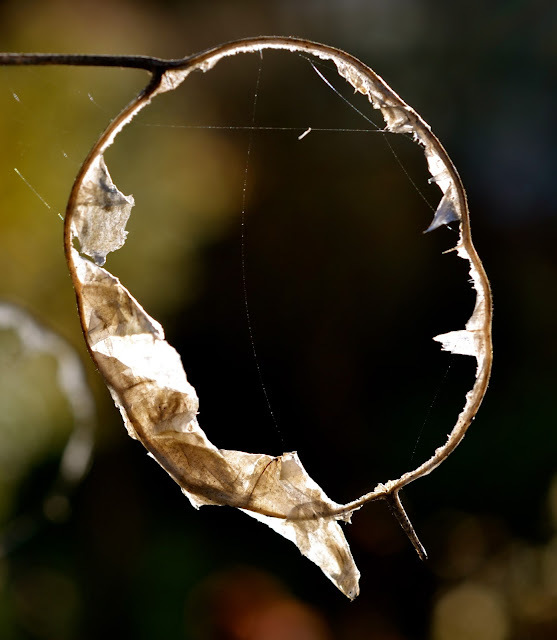 The papery seedpod has been torn away, revealing a perfect O, draped with a few filaments of spider web. It reminds me of those flaming hoops that circus performers used to jump through on the Ed Sullivan Show. Anna at Flutter and Hum hosts Wednesday Vignette. Check out her post here. Great shot! It gets a standing O from me! Great Flaming hoop of Honesty Alison, wonderful photo! Oh-some! That's a wonderful image, Alison! Perfect-O! Great pic :) Happy Thanksgiving! That, my friend, is stellar! Love it! That's exactly what it looks like! Happy Thanksgiving Alison! Great photo! It makes me think of the start of a dreamcatcher.